Pam lives in North East, PA, which is a small town outside of Erie right on the lake. She loves traveling and especially enjoys getting away during the long winters to warmer locations! She is married with three adult children. She is also a grandma now! She joined the MEI & Mouse Fan Travel team in 2008. She has been to Walt Disney World yearly (more when possible!) since 1994 while her children were growing up and was anxious to share her love of the resorts and parks with others to help them plan their own magical vacations. She has visited Disneyland, stayed at Disney’s Hilton Head Island Resort, and has been on the Disney Dream and the Disney Magic ships. Her goal is to stay at each of the Disney resorts and sail on each of the ships to better help her clients with first-hand knowledge of each property. She has also visited Universal Orlando and stayed in two of their resorts (so far!) and has visited the others. She has toured Norwegian, Royal Caribbean and Celebrity ships as well. Pam has graduated from the College of Disney Knowledge and attended agent training opportunities at both Disney World, Disneyland and Universal Orlando. She has also completed training on Royal Caribbean, Princess, and Norwegian cruise lines as well as Hawaii Visitors & Convention Bureau, Disney’s Aulani Resort in Hawaii, Adventures by Disney, and done a tour with New York City Vacation packages. 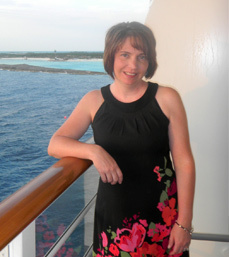 She looks forward to helping you make wonderful memories on your next family vacation!